My name is Bree Weasner, and I’ve been bringing pet owners like you valuable information on pet nutrition and natural holistic alternatives to conventional pet care since 1999. Pictured here are my three passions, Zeus (7), Max (6 months) and Alli (5). I’ve been owned by Boxers since August of 1987 and am obsessed with this silly breed. Photo taken in 2004. 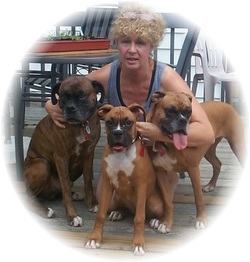 My ‘all natural’ journey began in May of 1999, when I lost one of my Boxer girls to bloat/torsion. To my horror, I learned that one of the reasons my special girl left me was because of the horrid, popular commercial food I was feeding her (and my other Boxers) over the years. Needless to say, I was totally horrified that I had been feeding my precious babies toxic chemical preservatives, by-products not fit for human consumption, euthanized animals, road kill – the list goes on… It was during this time in my life that I went all natural myself with my Boxers, and have become a very active advocate in teaching pet owners everywhere, the dangers of commercial pet food, and the benefits of feeding an all natural, holistic diet! I am not a veterinarian, and I am not medically qualified to answer many health questions, and I will not hesitate to tell you that “I don’t know”! My experience comes from my own personal life experiences, as well as the experiences of my friends, family, colleagues, visitors and even my customers.